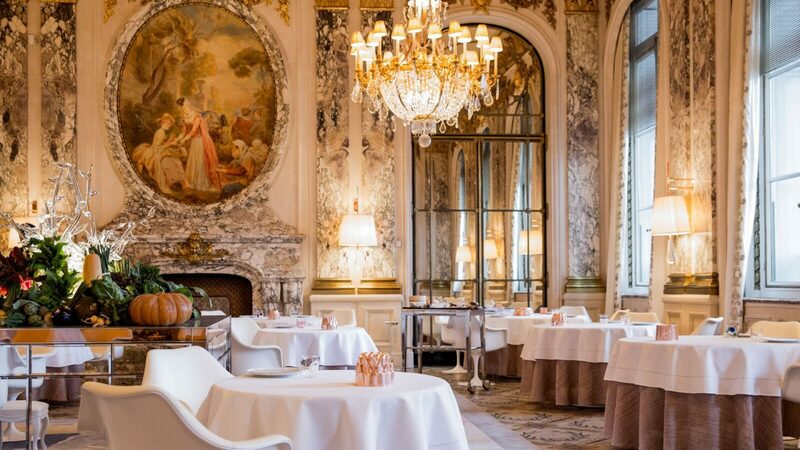 The two Michelin-starred Restaurant le Meurice Alain Ducasse celebrates Ducasse’s culinary philosophy under the mastery of executive chef Jocelyn Herland. In a reinterpretation of classic haute cuisine, dedicated to great subtlety and technical skill, exceptional ingredients remain true to their authentic flavours. Inspired by the Salon de la Paix at the Château de Versailles, the majestic setting has been carefully enhanced by more playful touches, including iconic Eero Saarinen Tulip chairs, two decorative screens and a sculpture capturing the suspended movement of water. These modern elements sit perfectly amongst the antique mirrors, crystal chandeliers and elegant frescoes, creating a stunning setting for the outstanding cuisine. Chef Alain Ducasse has developed over 30 years a unique knowledge in the art of living and eating. He is at once a chef-creator and a strict entrepreneur. As creator, he insists on offering a cuisine that is just right. As entrepreneur, he implements a modern economic model, a transfer of his knowledge and a relevant vision of the food service and hospitality industry. Alain Ducasse is at the helm of 26 restaurants worldwide, 3 luxury country inns and a hotel association : Châteaux & Hôtels Collection. His vision of the profession places passion and transmission of knowledge at the forefront of his projects. This can be clearly seen throughout his activities in publishing, training both professionals and amateurs, and finally consulting. As a passionate leader, Alain Ducasse is constantly looking to share his vast cultural awareness and curiosity with the rest of the world. Born in Auvergne, France, Jocelyn Herland, has worked with Alain Ducasse for many years. From 1997–2000, he was chef de partie at Restaurant Alain Ducasse at 59 Avenue Poincaré (three Michelin stars). He then moved as chef de partie to Restaurant Opéra (one Michelin star) at Hotel Intercontinental in Paris, and as sous chef at the Royal Monceau Hotel. 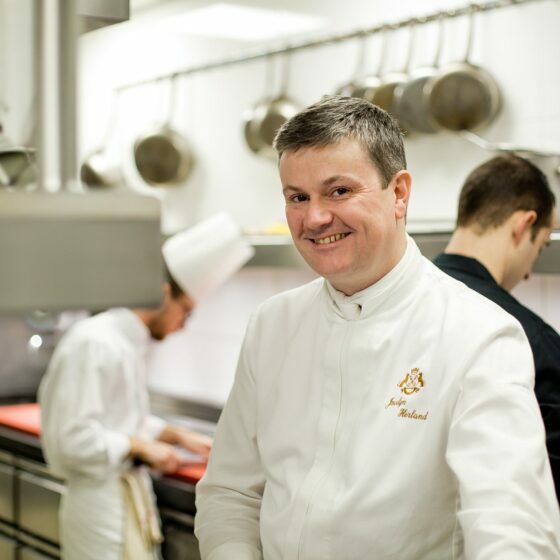 In December 2003, when Alain Ducasse introduced new head chef Christophe Moret to Alain Ducasse au Plaza Athénée in Paris, Herland joined him as sous chef, progressing to chef adjoint (deputy). In 2007 Herland became executive chef at Alain Ducasse at The Dorchester (three Michelin stars), before moving to Le Meurice as executive chef in January 2016. In keeping with Alain Ducasse’s philosophy, the freshest and seasonal produce, strictly sourced for their quality and provenance, are vital to providing the finest cuisine. Cédric was born in Firminy, a small French village in the Rhône-Alps region of the Loire. At the age of 32, he is now the head pâtissier at Le Meurice and he was recently named ‘The World’s Best Pastry Chef’ at The World’s 50 Best Restaurants Ceremony 2018. At the very heart of the restaurant is our dedication to celebrating the essential nature of every ingredient. This results in delicious dishes of great subtlety, created with simple produce. From here the journey begins. Inspired by the Salon de la Paix in the Chateau de Versailles and reinterpreted by Philippe Starck, this is a room of majestic, classical elegance combined with contemporary delight and humour. 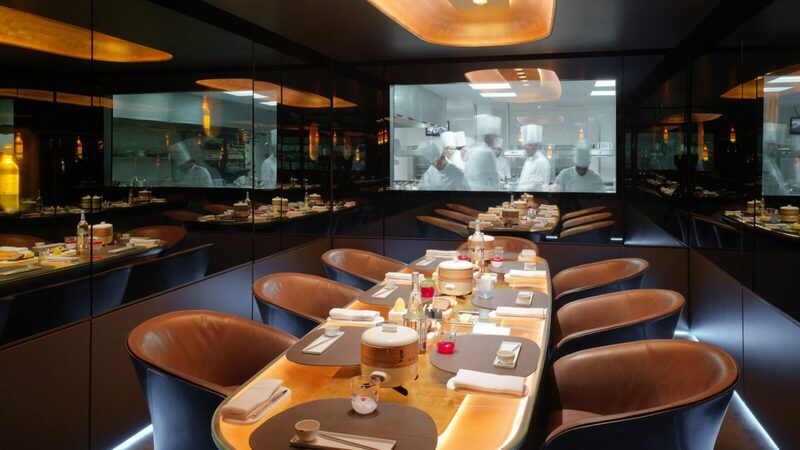 Enter a theatre of surprise through a private entrance and learn the secrets of the Michelin-starred kitchen from this most exclusive and beautiful table. Here, executive chef Jocelyn Herland guides you through his menu suggestions in an intimate atmosphere, while the kitchen performs its ballet before you. Remaining faithful to the authentic taste of the produce at every stage of the process until it reaches the plate. 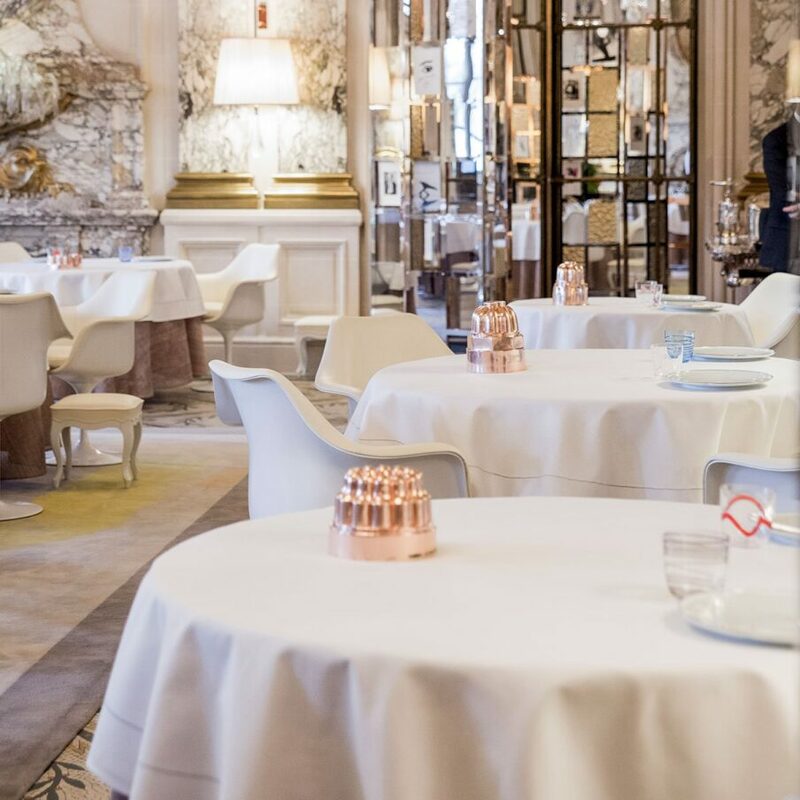 With the Collection menu, suggested at lunch and dinner, guests discover the essence of restaurant le Meurice Alain Ducasse’s cuisine, in a five-stage journey. This is the way to make your mark, to celebrate, to entertain, to leave an impression. Our lunch menu offers the same glorious cuisine and service in a shorter style but with memories that last just as long. 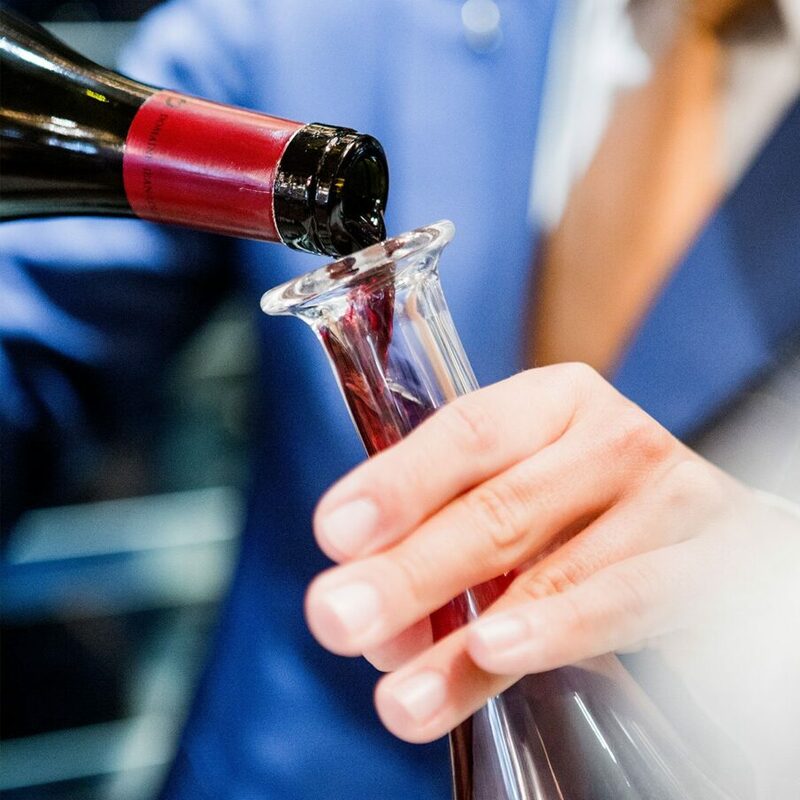 No great names amongst French prestigious wines are missing, but the connoisseur will also enjoy being lead towards lesser known labels in a selection that extends across Europe.